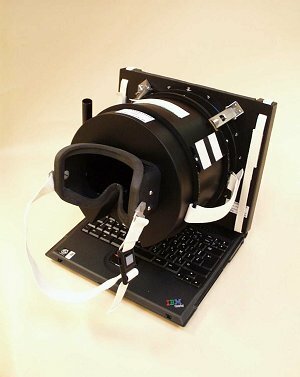 Etude neurosensorielle aussi appelée « Potentiels cérébraux d’attention dirigée dans un espace virtuel à 3 dimensions », l’objectif de cette expérience est d’évaluer la capacité d’orientation et de perception d’un sujet en apesanteur. C’est une expérience de Neuroscience qui étudie l’influence qu’ont les informations sensorielles de vue, d’équilibre, de mouvement, et de position sur la perception de l’espace et le contrôle du mouvement. Elle mesure aussi les temps de réponse à des stimuli en l’absence de pesanteur et effectue la comparaison avec les résultats des tests réalisés au sol (BDC -Baseline Data Collection). Comment l'absence de référence en état d'impesanteur affecte t’elle l'accomplissement de tâches cognitives ? 1ère hypothèse : La perception spatiale utilise un cadre de référence qui combine les informations de verticalité avec celles fournies par l’orientation de l’axe du corps, en l’absence de la 1ère information, quel cadre de référence utilise t’elle ? 2ème hypothèse : Une alternative à ce cadre de référence doit être élaborée pour la microgravité, ce qui implique un processus cognitif supplémentaire à chaque étape du mouvement. On s'attend donc à des temps de réaction plus élevés. 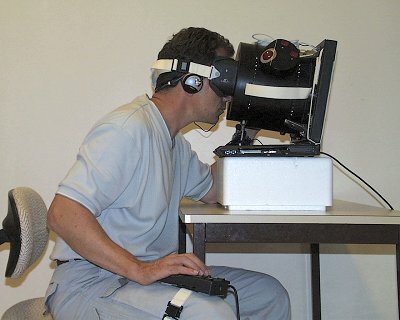 “Tours virtuels ” : Le sujet se déplace virtuellement dans un tunnel comportant un angle avec plus ou moins d’inclinaison et doit trouver cet angle d'inclinaison. “Orientation Visuelle” : Une ligne de référence orientée d’une certaine manière est affichée sur le moniteur vidéo, elle disparaît et à sa place apparaît une vue aléatoire avec des lignes dans différentes directions pendant quelques secondes, enfin une nouvelle ligne dans une orientation différente de la première s’affiche ; le sujet doit retrouver l’orientation initiale. En parallèle l’activité cérébrale est mesurée à l‘aide d’électrodes. Cartes PMCIA pour enregistrer les électro-encéphalogrammes. The processing and storage of visual information concerning the orientation of objects in space is carried out in anisotropic reference frames in which all orientations are not treated equally. The perceptual anisotropies, and the implicit reference frames that they define, are evidenced by the observation of `oblique effects' in which performance on a given perceptual task is better for horizontally and vertically oriented stimuli. The question remains how the preferred horizontal and vertical reference frames are defined. 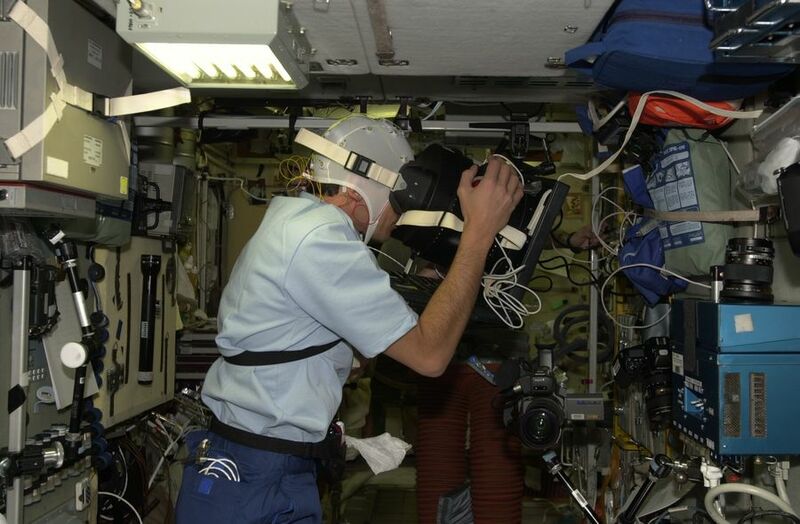 In these experiments cosmonaut subjects reproduced the remembered orientation of a visual stimulus in 1g (on the ground) and in 0g, both attached to a chair and while free-floating within the International Space Station. Results show that while the remembered orientation of a visual stimulus may be stored in a multimodal reference frame that includes gravity, an egocentric reference is sufficient to elicit the oblique effect when all gravitational and haptic cues are absent. Mu and alpha oscillations (8-12 Hz) are the most prominent electroencephalographic rhythms observed in awake, relaxed subjects. Different cortical sources may participate in these oscillations and appear to be modulated by the ensorimotor context and functional demands. In microgravity, the marked reduction in multimodal graviceptive inputs to cortical networks participating in the representation of space could be expected to affect these spontaneous rhythms. Here, we report the results of an experiment conducted over the course of 3 space flights, in which we quantified the power of the mu and alpha rhythms in relation to the arrest reaction (i.e. in 2 distinct physiological states: eyes open and eyes closed). We observed that the power of the spontaneous mu and alpha rhythms recorded in the eyesclosed state in the sensorimotor areas (mu rhythm) and in the parieto-occipital cortex (alpha rhythm) increased in microgravity. The suppression coefficient produced by eye-opening/closure state transition also increased in microgravity. These results are discussed in terms of current theories on the source and the physiological significance of these EEG rhythms. Electroencephalographic oscillations at 10Hz (alpha and murhythms) are the most prominent rhythms observed in awake, relaxed (eye-closed) subjects. These oscillations may be considered as a marker of cortical inactivity or an index of the active inhibition of the sensory information. Different cortical sources may participate in the 10-Hz oscillation and appear to be modulated by the sensory context and functional demands. In microgravity, the marked reduction in multimodal graviceptive inputs to cortical networks participating in the representation of space could be expected to affect the 10-Hz activity. The effect of microgravity on this basic oscillation has heretofore not been studied quantitatively. Because the alpha rhythm has a functional role in the regulation of network properties of the visual areas, we hypothesised that the absence of gravitywould affect its strength.Here,we report the results of anexperiment conducted over the course of 3 space flights, inwhichwequantifiedthepower of the 10-Hz activity in relation to the arrest reaction (i.e., in 2 distinct physiological states: eyes open and eyes closed). We observed that the power of the spontaneous 10-Hz oscillation recorded in the eyes-closed state in the parieto-occipital (alpha rhythm) and sensorimotor areas (mu rhythm) increased in the absence of gravity. The suppression coefficient during the arrest reaction and the related spectral perturbations produced by eye-opening/closure state transition also increased in on orbit. These results are discussed in terms of current theories on the source and the importance of the alpha rhythm for cognitive function.